I am fascinated by all the missed interpretation by most of the politico’s that get paid huge money or are considered the cognoscenti. What perplexes me is the way they perceive a political debate or event. I would love to put together a panel of folks and do a play by play while we watch the event. In other words, while the event is taking place we can get four folks and comment while it’s happening–it would be a great experiment. I would love to be given the opportunity to show those who get paid huge sums in preparing their clients how we would respond or advise the candidates. Let’s announce the debate like a championship game. It would also be fun to do a show that then brings what the pundits are saying and how their bias does or does not show in their opines. Now to my observation at hand. I waited for a few days to weigh in just to see how it would play out. First let me say that I am an independent, I have no party affiliation except as a citizen of this Great Nation, so I can look at the candidates with a very objective eye and ear. Here is my opine. During the last debate at CNBC—regardless of all the bias witnessed—a certain point got lost in all the fireworks. 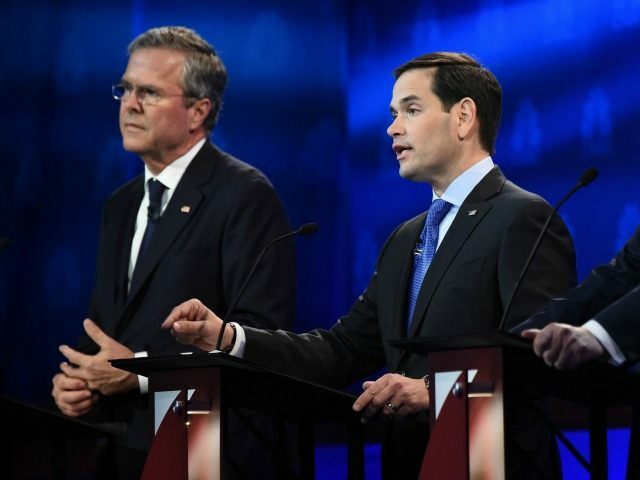 It is when Jeb leaned hard on Marco Rubio about his missing votes as Senator and Marco deftly parried Bush’s thrust like a skilled Olympian fencer or a Welterweight blinding his opponent with a flurry of unanswered jabs. Marco is Cheetah-like in his swiftness of mind! You’re absolutely right Marco, but I wasn’t running against them at the time, if I were, you can damn well be sure I would have been as vocal in my protest with them as I am on your double dipping. You are committing fraud on the American people. As a matter of fact this is being done by the whole political class, who think they are above the private citizen. If any one listening who is hard working and had the amount of absences in their work place because they were looking for a “better job,” you can be sure they would be fired. So resign from your seat and be honest or suspend the money the American people pay you to be a Senator not run for president. Now had Jeb Bush taken a breath after fast talking Marco went through his diatribe and came back with what I just said, I guarantee big donors would be looking at their money gamble differently. Also, I Greatly appreciate Rubio’s tough life narrative but it seems more like a sympathy, how-hard-my-life-has-been plea and I just don’t need to keep hearing it. I like Marco, he needs more seasoning for me, he lacks a certain humor and needs more weight. A heavyweight like Hillary will eat him for breakfast. Remember Rick Lazio When she ran for Senate? I don’t expect a lot of folks will appreciate this article, but I had to write it and share my perception. If I were directing Hamlet and Marco Rubio was the actor, I would tell him to play Hamlet as if he were in a high comedy. The role is already intense and a young actor trying to prove himself misses out on the humor and weight. Playing one deft note gets tiresome. I hear the intensity but not the music. I don’t like when a candidate steamrolls over someone. While everyone is saying that Marco dressed Jeb down, the truth is his Senate record is important and he should be held accountable. Bush choked. I know many brilliant young bright minds who talk super fast as if they are superior in their thinking and knowledge and steamroll, but when given the time to analyze, they lack the weight and deeper wisdom. I understand the GOP donors—most have lovely women in charge and advise their donor purse strings and I can bet they are enamored of the young Marco and the GOP looking for that “star factor” to rally round and get the Latino vote. This makes him appealing to them. I would have liked to see him in the Senate for a bit doing his job. I am also tired of the “Well Obama did it” analogy, or the JFK reference. JFK had much more weight. Congress and then Senate for seven years. Anyway, there is my 2 cents. Now that I got it of my chest I will go and read Fox News’ host Greg Gutfeld’s new book and have some laughs along with his unique point of view. We need a Lion. Marco is Cheetah-like in his swiftness of mind. Watch what the lion does to a cheetah when in the wild.